Simple & Quick Interface, Special enriched features! Makes your e-filing experience a Breeze! Fastest & Safest website at an affordable Price! The most experienced and Top Rated! Pricing choices to meet your filing needs! Quarterly Federal Excise Tax Form 720 is used for reporting federal excise tax liabilities on certain products (gasoline and fuel) and services (tanning salon and PCORI). These are excise taxes on activities, such as on wagering or on highway usage by trucks. One of the major components of the excise program is motor fuels. Federal Excise Tax Form 720 and attachments are to report to the IRS at end of every quarter listing the liabilities and pay the taxes collected. Who must file Form 720? You must file Form 720 if you were liable for, or responsible for collecting, any of the federal excise taxes listed on Form 720, Parts I and II, for a prior quarter or for the current quarter and you haven’t filed a final return. In other words, if you own a business that deals in goods and services subject to excise tax, you must prepare a Form 720 quarterly to report the tax to the IRS. The federal government charges an excise tax on specific types of products and services, which has to be collected and paid to IRS at regular intervals, quarterly. How to file Form 720? IRS Tax Form 720 can be prepared with simple probing questions and pay any liabilities online through TaxExcise.com. E-filing is always available, prepare a return anytime from anywhere and report it online directly to the IRS. E-file could get you error free returns, you won’t miss out anything that is required to report excise taxes. Express service, faster processing of tax returns, and acknowledgement in minutes. Record keeping is easy, download your Form 720 PDF any time. 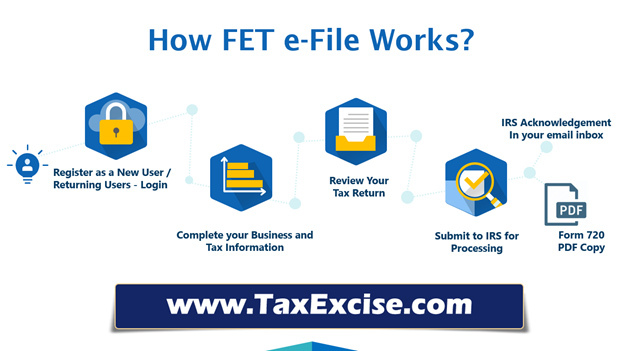 E-file is the most preferred option of reporting excise taxes with the IRS. However you can also take a print out of the complete Form 720 PDF and file it manually or mail it across to the IRS as specified in the form. When is Form 720 due? How much it is to efile? E-file is the fastest way, you could try for free and experience the difference. Form 720 repored every quarter would cost you $49.99 on single category. No other charges or no hidden charges, we won't ask for your card details upfront. Just login to the access your account dashboard. Add your complete physical address of your business, Employer Identification Number (EIN) and the tax related information. Choose the tax form, filing period and the filing quarter. Start entering your tax information, review the information in consolidated summary. Choose e-file, pay the processing fee with your credit/debit card and submit your Quarterly Federal Excise Tax return for processing. IRS acknowledgement would be sent to your registered email inbox. If you have subscribed for Text Alert, message will be shared to the cell number. You may print a copy of your Form 720 PDF any time by accessing your user account. Efiling or electronic filing is submitting your federal excise tax returns online to the IRS directly from TaxExcise.com website. There are two ways to filing your federal excise tax returns. The traditional way is the offline way, where you manually fill in directly or through a tax preparer you file your returns. The other way is when you e-file through the internet. E-filing has become popular because it is easier, doesn’t require prints of documents, and can be done in less time! Prepare your Quarterly Excise Tax 720 Return for all 4 Quarters – Jan to Dec. Dedicated tax expert who will work hard to take care of your filing and guarantee 100% accuracy as well as your satisfaction with his work. Email or Chat or Call, we have experts to handle it with care. You’re with the most trusted e-file website since 2007 and rated top “the market leader” by your fellow truckers. Secured and Safe tax filing services from a renowned Tax e-filing company. 100% secure by Thawte SSL with encryption measures built in and an assurance about confidentiality of your personal information through McAfee Secure. Anytime, anywhere access to your tax information and documents. This includes access to your Federal Excise Tax Returns, Schedule -1 copies, year-round assistance. Record KeepingThe tax return is available anytime for easy downloading, easy record keeping. Tax720.com is an extended website of TaxExcise.com, an IRS Authorized e-file provider since 2007 to e-file Quarterly Federal Excise Tax returns. Owned & operated by ThinkTrade, Inc.
© TaxExcise.com | ThinkTrade, Inc. All rights reserved.